Loud passages, well recorded, don’t “shout.” Rather, they embrace. This production’s deep-nap textures impart a lifelike quality to soloists, chorus and instrumentalists, all of whom impress us as first rate. Pearlman’s emphasis and pace translate, entirely appropriately, to a sense of ebullience and joy. Something we read in an earlier life positions Haydn and Mozart before and after Original Sin. Amen to that! 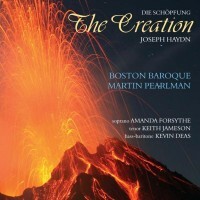 The cast: soprano Amanda Forsythe, tenor Keith Jameson, bass-baritone Kevin Deas, the Boston Baroque’s instrumentalists and chorus, Martin Pearlman directing. Linn CKD 401. The notes to Fausto Romitelli’s CD, Anamorphosis (Tzadik Composer Series TZ 8087), contain a statement by the Italian composer (1963-2004), which includes: “At the center of my composing lies the idea of […] sound as a material into which one plunges in order to forge its physical and perceptive characteristics: grain, thickness, porosity, luminosity, density and elasticity. Hence it is a sculpture of sound […].” To say again, recording is a craft that, well done, fully reveals a work’s qualities – its sonic riches – as little else can. And this, good reader, is what perfectionist audio strives to achieve. 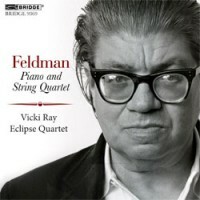 A recently arrived Bridge CD (Bridge 9369, released in 2011) marks our Morton Feldman collection’s third recording of the composer’s Piano and String Quartet, composed two years before his death in 1987. A Nonesuch CD (9 79320-2), issued in 1993, features the players for whom Feldman wrote this masterpiece: Aki Takahashi and the Kronos Quartet. Another, hat[now]ART 128, with the Ives Ensemble (Amsterdam), appeared in 1991 as but one of hat’s stellar Feldman series – and our introduction to what has become an addiction. This 2011 Bridge, with pianist Vicki Ray and the Eclipse Quartet (Sarah Thornblade, Sara Parkins, violins; Alma Lisa Fernandez, viola; Maggie Parkins, cello), is a remarkably beautiful recording. The instrumentalists strike a perfect balance between ethereality and volupté, which the production’s technical aspect supports with commensurate sensitivity. The strings are as if suspended in space, and too, the piano – a rather more difficult illusion. The reading has the feel of a protracted love song. Peel away the avant-garde daring – the late music’s bare-bone, not quite repetitious, narrative-free excursions of extraordinary length – and we find a sensualist. No one has ever surpassed Feldman’s regard for his instruments’ sonorities. Congratulations and gratitude to producers Erika Duke-Kirkpatrick and Jess Gauthier, and recording engineer John Baffa. 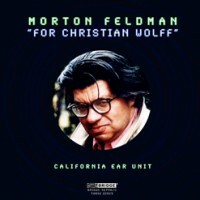 Feldman’s 1986 For Christian Wolff, for flute, piano and celesta (Dorothy Stone, flute; Vicki Ray, keyboards) is a much longer and rather more challenging work. The duo’s reading, along with the style of recording, as compared with Piano and String Quartet, and bearing in mind Feldman’s devotion to low-volume performances, plays – again, relatively – as four-square direct. Not that we’re complaining. Given the music’s extraordinary duration and absence of those seductive, organ-like strings, the interpretation strikes us as perfectly fitting. Close to three hours of applied atmospherics would have proven a bit much. 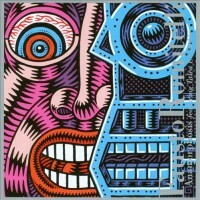 Bridge 9279A/C, three CDs, released in 2008.